Devi Mariamman is the name given in South India to the more recognisable Sheetala Mata. She is known to infuse Her devotees with divine cool and calm ('sheetal' in Sanskrit means 'cool'). In Tamil, the suffix 'amma' stands for 'mother', denoting the nature of the people's devotion to Her. She has been traditionally worshipped as the curer and eradicator of the smallpox disease, and even though smallpox is almost unheard of in India, devotees flock to Her temples in ever-increasing numbers to this day. 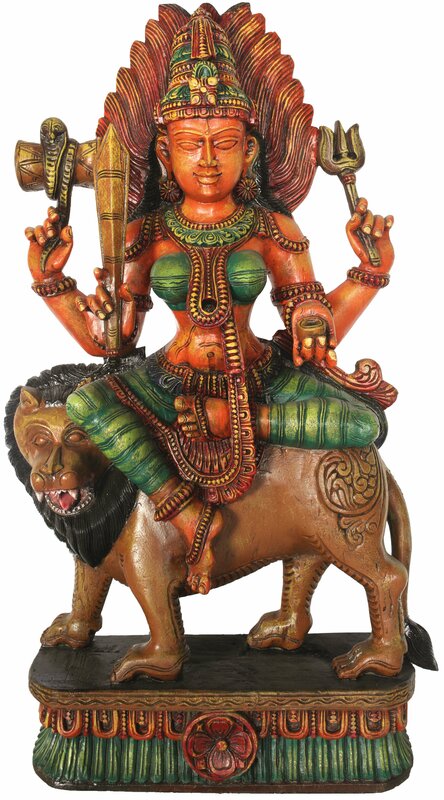 This svaroopa of the Devi Mariamman has been carved out of wood. Given the statement singhasana (lion-seat) and the votive pedestal the composition is on, it is clearly designed to be housed in one of the signature temples of the South. The finish of the work is inimitable - a lifelike composure of countenance, the smooth musculature of Her form, and the shringar that rests against Her body. She is draped in green silks; a necklace of emeralds rests on Her torso; and hints of green are to be found in the crown that towers above Her head. In Her four hands She bears (clockwise from posterior right of the Devi) a snake-clad damru to indicate Her identity with Shiva, a trishool to indicate the three kinds of pain (adhyatmika, adibhoutika, and adidaivika), a kapala cup that She holds out as an offering to Her devotees, and a dagger to battle adharm with. Like Hindu devis usually are, She is beauteous and calm; She fulfills the needs and wants of Her devotees; and maintains the stability of the dharmic cycle by Her very presence.